A double for champion sire Galileo as Marvellous lives up to her name with victory in the Irish 1,000 Guineas. Marvellous gave Ryan Moore a first victory in the Etihad Airways Irish 1,000 Guineas by cutting down 100-30 favourite Lightning Thunder inside the final furlong at the Curragh. Trained by Aidan O'Brien, the daughter of Galileo (10-1) was having only the third start of her career in the Classic, having finished sixth on her latest appearance in the Leopardstown trial on March 30. Lightning Thunder, agonisingly beaten by Miss France at Newmarket, ran a fine race once again but simply had no answer to the thrust of Marvellous, who shot three lengths clear after putting in a sustained run from the rear. The winner's stablemate Wonderfully made the running, but Harry Bentley swept past on the market leader with a couple of furlongs remaining, before Marvellous appeared on the scene to give O'Brien his sixth victory in the race. James Doyle, who won Saturday's Irish 2,000 Guineas on Kingman, finished third aboard the Dermot Weld-trained Vote Often. Marvellous was subsequently slashed to around the 10-1 mark for the Investec Oaks. 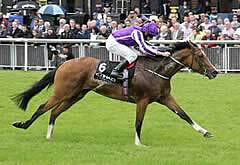 O'Brien said: "She handled this sort of ground when she won her maiden at Navan last year. She then had the one run this year at Leopardstown and had a bit of a break after that as, like a lot of mine, she was coughing a bit. "Joseph (O'Brien, rider of stablemate Palace) had a tough choice and he knew it was a close call, but at declaration time we didn't think it was going to get as soft as this. "With Marvellous, the plan was to come here and then on to Epsom. You'd have to say she'd definitely get a mile and a quarter the way she ran to the line. She's a nice, compact filly and I don't think she'd have any problems handling Epsom."